Notes on why anarchists have created libraries (past and present) and some of the challenges they face, drawing on a survey of current anarchist libraries, anarchist history, and the author's own experiences at the Kate Sharpley Library. For anarchists—those defined in the most general terms as believing in a political and social theory of society without government and through voluntary relationships—the written and published word has been central to their movement. From early on, anarchists in the United States and Europe published and collected their ideas and written work. This published literature was one of the main sources of anarchist propaganda and a means to communicate and spread ideas. Newspapers, pamphlets, and, books were instrumental in sharing and documenting the philosophies and actions of the anarchist movement; anarchist libraries were a natural continuation and followed shortly thereafter. Many early English language anarchist periodicals produced pamphlet series, often with some sort of anarchist library subtitle. For example, early American journals such as Liberty, Free Society, and Mother Earth had pamphlet series called the “Liberty Library,” “Free Society Library,” and the “Mother Earth Library.” The long-running English anarchist paper Freedom also maintained a pamphlet series called the “Freedom Library.” The collecting of anarchist ideas in this format became a regular feature of anarchist periodicals and publishers and developed a body of knowledge—or library—usually not available elsewhere, that anarchists and those curious about anarchist ideas could draw from, discuss, and share. But anarchists were not only interested in publishing and distributing their ideas in pamphlet and, later, book series; they were also interested in libraries in the more traditional sense. In Philadelphia, a Radical Library was established as early as 1895 by the Ladies Liberal League of Philadelphia, a group that included anarchists Voltairine de Cleyre and Natasha Notkin and whose mission was to “repair a deficit in the public libraries by furnishing radical works upon subjects at convenient hours for working men and accessible to all at only a slight expense” (Falk, Pateman, & Moran, 2003, p. 459). This library would continue in various forms for at least the next 20 years. It became a social and political center for anarchists in the Philadelphia area, with anarchist Joseph Cohen taking an active role in their activities throughout the 1910s (Avrich, 2006, p. 60-61). Anarchists formed similar libraries and social centers in other major cities, such as the Progressive Library in New York City, where in 1906 a group of anarchists was arrested while holding a meeting to discuss Leon Czolgosz’s assassination of President William McKinley five years earlier (Falk et al., 2003, p. 200). In Europe, a similar interest in anarchist libraries was present in the Spanish Modern Schools. The Modern Schools were a rational educational project begun by Spanish anarchist Francisco Ferrer, and as part of this initiative, a publishing program and library were created (Avrich, 2006, p. 19-23). These Modern Schools spread to the United States after Ferrer’s death, and when a Ferrer Modern School was founded in New York City in 1910, it included not only a school and meeting rooms, but also a library. A Francisco Ferrer Club in Chicago contained a “free library and reading room” (Avrich, 2006, p.78, 62). Later, in 1921, following Russian anarchist Peter Kropotkin’s death, a new Kropotkin Library was built in his honor at the Stelton Modern School in Stelton, New Jersey (Avrich, 2006, p. 304). Anarchists saw their libraries as vital social centers for their movement. These libraries were not simply places to collect social and political books that addressed anarchism; they were active locations for anarchism. They were meeting places and spaces to share, spread, and develop the ideas of the anarchist movement. Yet anarchists have also wanted to preserve their written propaganda and political culture for the future, and they have used and participated in the resources of more traditional institutional libraries. One of the oldest collections of anarchist material in the United States was established at the University of Michigan when anarchist and labor activist Joseph Labadie donated his personal papers and library there in 1911. This collection was later organized and further developed by anarchist Agnes Inglis, who was curator of the Labadie collection from 1925 until 1952 (Herrada, n.d.). The Labadie Collection today remains one of the most important collections of anarchist material in the United States. Emma Goldman would establish her and Alexander Berkman’s archives at the International Institute of Social History (IISH) in Amsterdam in December 1938, a time when the IISH was collecting the papers of labor activists and other radical individuals throughout Europe as Nazism spread. Around the same time that Goldman was depositing her material, the IISH librarian smuggled anarchist Mikhail Bakunin’s papers (as part of Max Nettlau’s collection) out of Germany (International Institute of Social History, n.d.). In both of these cases, anarchists recognized the importance of preserving their collections of books, papers, pamphlets, and ephemera for future use. These collections still exist and continue to be rich sources for documenting anarchist history, though they are held within larger institutions and among other non-anarchist collections. But they are the exception; most anarchist libraries and archives are located not within the boundaries of larger university or institutional walls, but very consciously outside them. The proliferation of anarchist libraries, infoshops, and archives in the present day demonstrates that anarchists have maintained that instinct to preserve and provide access to anarchist literature. In most major cities, one can find at least some sort of anarchist infoshop with a library attached, and there are a growing number of online libraries and archives. In many cases, these collections have developed over time both as a continuation of a historical interest in using the written word and public space as propaganda to promote and explain anarchism, and also to fill a gap missing in more traditional, mainstream, and institutionally-based library and archival collections. These collections are rooted in the belief that access to anarchist literature was an important component of the movement, and in the reality that outside of the movement, anarchist literature was difficult or impossible to find. Anarchists, by definition suspicious of the state and its institutions, have also wanted to protect their own historical writings and culture. As others have noted, “While there are of course some very notable collections in both state and university collections, the majority of anarchist materials remain in the hands of the producing communities, preserved by the people who participated in the very struggles that are being documented” (Hoyt, 2012, p. 32). In many ways, anarchist libraries and archives today fit within the larger umbrella of independent community archives. Independent community archives should be seen as “social movements (or as elements of social movements)” that are part of the “development of subversive and counter-hegemonic social or public memories” according to Andrew Flinn and Mary Stevens (2009, p.4). Community archives can be defined broadly as the “grassroots activities of creating and collecting, processing and curating, preserving and making accessible collections relating to a particular community or specified subject” (Flinn & Stevens, 2009, p.5). These activities look different depending upon individual circumstances and communities, and often the activities that define a “community archives” may take place without the terms themselves ever being used (Flinn, 2007, p. 152). Flinn (2007) writes that “community histories or community archives are the grassroots activities of documenting, recording and exploring community heritage in which community participation, control and ownership of the project is essential” (p. 153). Collections organized and created around a shared identity and interest in anarchism and the anarchist movement situate anarchist libraries and archives firmly within the independent community archives movement. In reviewing the development of community archives in the U.K. in working class and ethnic and religious minority communities, Flinn and Stevens (2009) suggest that these initiatives emerged out of an activist or oppositional political community or culture: “[m]ost if not all community archives are motivated and prompted to act by the (real or perceived) failure of mainstream heritage organizations to collect, preserve and make accessible collections and histories that properly reflect and accurately represent the stories of all society” (p. 6). These archives are often viewed not only as tools for education but also as weapons in struggle. Community archives should not be seen as vanity projects, nor as alternatives to active struggle, but rather as acts of resistance, consciously made. This context helps explain why many community archives projects are hesitant or resistant to giving up autonomy over the management of the archives. However, in maintaining full autonomy outside of mainstream institutional control, independent community archives are faced with many challenges to the sustainability of their projects. Financial stability, keeping the archives open, and managing the long-term preservation of the archives become ever-present and ever-increasing efforts. In one 2011 study of New Zealand community archives, Joanna Newman (2011) concluded that in fact those archives within a local council or other government institution had the most stable funding, skilled staff, and adequate space and materials to protect and preserve the archives. She further found that some of the community archives continued to exist “only because of the passion and commitment of one or two individuals” (p. 37-45). Newman’s findings are representative of community archives projects around the world. In many cases, the archives project has been developed and kept going through the deep enthusiasm and involvement of a few people; however, maintaining such a project over the long term becomes harder. As Flinn and Stevens (2009) note, “[i]f resources remain scarce and the energy of key figures begins to wane, maintaining independence from the state and its institutions may become increasingly difficult for many independent community archives to sustain” (p. 17). Anarchist libraries and archives make up one segment of community libraries and archives. They can range from a small collection of warped and dog-eared pamphlets and books, to a carefully curated and managed collection within a university setting, to a collection of links or PDF files on a website. Whatever the form these libraries take, they share some similarities. Like the independent community archives discussed above—with a few notable exceptions—most prefer to remain outside the scope of larger governmental and nonprofit organizations, instead relying on the volunteer service of a few committed individuals. These people see themselves as keeping anarchist history alive and contributing to the body of knowledge that makes up anarchism. These projects are not seen simply as an archive or library for the archive or library’s sake, but rather as part of the anarchist movement, and their work is a contribution to that movement. They are preserving the history of the anarchist movement to correct absences or mistakes in the historical record, as well as to inform and potentially help direct the future of the movement. In preparing the research for this article, I sent out a survey in 2012 and received responses from 26 anarchist archives and libraries throughout North America, Europe, South America, and Australasia. I was interested in questions of funding and sustainability, as well as staffing—how many people were involved with a project, what their skills and experiences were, and why they did the work they did. The results of my survey found that of the 26 respondents, 14, or a little over half, are either fully self-funded by workers in their respective libraries or archives or funded through a combination of self-funding and donations. Of the rest, seven are funded through membership or research/reading fees in addition to fundraising. Only one archives, the Archivio-Biblioteca Enrico Travaglini in Italy, received any government money, and that was less than 1500 Euros per year; as they wrote, “funding is still insufficient” and supplemented through self-funding. The four remaining respondents were smaller anarchist collections within university libraries that are financed through their institutions. Excluding those collections within university libraries, all the libraries and archives depend entirely on volunteer labor, with the exception of the International Centre for Research on Anarchism (CIRA) in Switzerland, which is formally registered with the Swiss government as an association and has in the past been able to employ one person. CIRA also uses the labor of young men completing civilian service as an alternative to the military. The size and scope of these archives vary widely, from collections of a few hundred books, pamphlets, and zines to those with over 20,000 items cataloged. Where collections are held also greatly varies, though the majority seem to be either in private homes (seven) or as part of other anarchist or radical spaces (six). Other locations include university settings, rented locations, or online only. Outside of the university setting, few appear to have purpose-built or stable and secure long-term storage. Interestingly, a substantial number of those responding (12) had at least one member within their group who worked in a library or archives or had library or archival expertise, though the major qualification for joining any of the projects seemed to be a willingness to do the work and an inclination toward or experience with anarchism and related social movements. A number of the more infoshop-type libraries, especially those with a lending library, offer some sort of formalized training program for new volunteers. While all of those responding to the survey said that their collection’s focus was anarchism and anarchist history, whether at the local, national, or international level, only about half had any kind of articulated collection or acquisition policy. Many explained that they rely largely on donations and will accept anything that broadly fits under the definition of anarchism, excluding anarcho-capitalism/libertarianism. Some also made an explicit point about trying to keep state socialist and Marxist material out of their collections, while at the same time they maintained an agnostic position on the many strains and threads within the anarchist movement. We initially conceived it as a sort of collectivized living room—a resource for the community of people who use the Cowley Club—sharing books, magazines, films and computers to make them accessible to everyone instead of just sitting in individual people’s living rooms. The library also functions as a meeting space for groups to use and additionally aspires to function as an archive of the history of radical social struggles, especially in the local area. 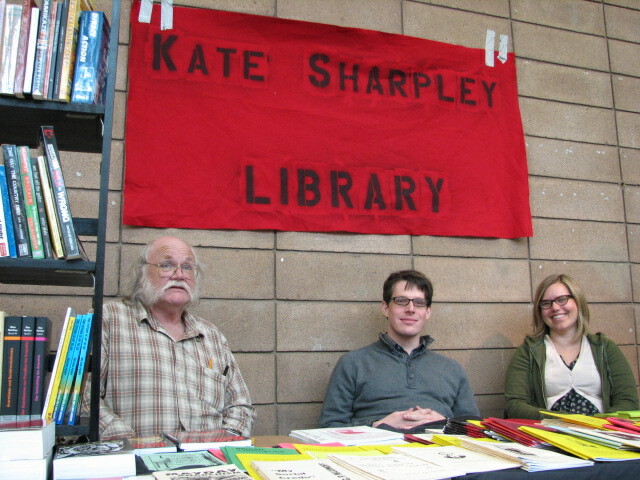 My interest in community archives generally and anarchist libraries and archives more specifically comes out of my personal participation in the Kate Sharpley Library (KSL). The KSL is an anarchist library and archive with its own very anarchist history. It was originally founded in 1979 as a radical library to serve the anarchist community in Brixton, London, and was connected to the 121 Anarchist Bookshop. Only later, when it moved out of London in 1991, did its main purpose change, morphing from a resource center to a special collection (and eventually archives) that focuses on documenting the history of anarchism (Longmore, 2004). Since 1991, the KSL has been maintained in a private home belonging to Barry Pateman. In 1999, Pateman moved to the United States and brought along the library. Over the next ten years, the collection has continued to grow and have a home with him. The KSL is currently housed in its own space in a 1500 square foot building and includes books, periodicals, pamphlets, articles, ephemera, manuscripts, and organizational archives. The library, located in California, usually has one to two in-person visitors per month, as well as regular research requests by email. My participation in the KSL began with my interest in anarchist history and experience working in libraries and archives. For me, it was a way to use skills I already had to help preserve what I see as important, including rare material that is not available elsewhere. Other members of the KSL collective are two people in the U.K. with library training who help collect U.K. and European items, translate writing in foreign languages, and select and edit material that is published in periodic newsletters and pamphlets. We also have members in the U.S. who help with the technical side of things, from developing an open source online catalog to maintaining our website and online collections. At the KSL, all work is voluntary and the format for participation is loose and informal. People become involved because they want and are able to help. While people often express a desire to help in the library, there are only about five who have a long-term involvement in the KSL. I have found in my own personal experience that the nature of the work is such that it is difficult for most people to sustain regular involvement in the project for a variety of reasons. While there are some wonderfully interesting materials in the collection, anarchists are also quite good at producing terrible materials, and beyond that, quite a bit of the general care and maintenance are the rather repetitive tasks such as filing, arranging material into a predetermined order, and simple cataloging. However, we do get visitors who are happy to help with some filing, shelving, or sorting for an hour or two. Within the KSL, there are no formal decision-making procedures, and apart from a strict policy to collect only anarchist material or material that substantially deals with anarchism, there are no formal collection policies. Perhaps our greatest collection development discussions are centered on exactly what the often permeable and porous definition of “anarchism” is, and where to draw the lines. Decisions are usually made because one member has the time and ability to carry through a project, or when a group of members has a chance to get together either in person or through email. All work is voluntary and takes place during members’ free hours, after work, on the weekends, or in other stolen time. This freedom in participation is both a benefit of the project and a weakness. Work—whether it is cataloging a book or other item, accessioning an archival collection, translating an article, editing a pamphlet, or updating the website—gets done because it is seen as important and members enjoy it, but it often gets done slowly and may not be members’ first priority, no matter how much they might wish it were. Most funding for the project comes from the sale of pamphlets, duplicate books, and periodicals at anarchist bookfairs; subscribers to our bulletin; and a few sustaining members who send us $10-20 per month in exchange for receiving the bulletin and any pamphlets we may publish. These funds never cover expenses, which range from simple things like printing costs to much larger expenses, such as ensuring the physical safety of the collections, buying an adequate supply of acid free folders and boxes, paying for the shipping of large items donated to the library, and having the funds available to purchase rare or expensive materials. Real Anarchism is not the cult of a few ‘well known’ quasi-father figures of the past, any more than real Buddhism is the worship of Gautama Buddha as a god. Anarchists in practice do not more care about what such persons said or wrote unless they happen to have said something with which they agree. The cult of researching their acquaintanceships, personal life and influences upon them is a deliberate ploy by State-sponsored academics, but it has nothing to do with us. The personality cult, the worship of individuals and the imposition of bourgeois ideas lead to a phony anarchism which may flourish but is not the real thing. Albert knew that anarchism was not just Kropotkin or Stirner, or whoever. It was the putting into practice of it all that was important. He knew that this could be done by people who had only a bare knowledge (if any!!) of our major writers and thinkers. He also knew that histories of anarchism excluded countless people who had been instrumental in its development and changes. Because these people often did not write theory or were prominent speakers they were ignored. Our contention is that lesser-known anarchists and events are just as, if not more, important than the “great” thinkers. In many ways, the KSL has followed the general shift of institutional and mainstream archives in the last few decades toward developing strategies to more systematically document the undocumented, listen for the silences in the archives, and widen the scope of collections to include people’s everyday lives. Another expression of the collection policy and justification for the work of the KSL read: “We do this to preserve and promote anarchist ideas and anarchist history. Not in a vague and fuzzy ‘learning is good’ kind of way, but because if we don’t do it, who will? […] Anarchism is the sum of years of struggle of thousands of comrades. Ideas are honed in argument, and in practice” (Kate Sharpley Library, 2004). Trying to document how anarchism was used in discussions over time, and how ideas were put into practice, explored, used, or rejected, allows for a much deeper understanding of the political theories. This article goes on to assert that while there will always be someone interested in preserving a first edition of Kropotkin, he isn’t the beginning and end of the anarchist movement. All the poorly printed, badly argued, or beautifully designed and articulate newspapers, pamphlets, books, and more that make up the anarchist movement help to shed light on anarchism as a human reality instead of a dead group of ideas. There are a number of questions my involvement with the Kate Sharpley Library has led me to, not just pertaining to the sustainability of the KSL, but also about anarchist and community archives collections more generally. Some of this concern may simply be a matter of balancing my professional training and experiences working in larger institution, with what is possible and makes sense when working on a volunteer-run project with little to no funding. But I worry about the proper care and handling of collections for preservation. I worry about the difficulty or lack of good recordkeeping for collections; as collections grow, institutional or personal memory isn’t enough, and it won’t be enough long-term. But I think my biggest worry, and perhaps the most important question, is that of the sustainability of the collections and the projects—how will they continue into the future? Will these collections of rare and important anarchist materials last from generation to generation? Or even year to year? How will they remain alive and relevant? There are anarchist libraries and archives of various kinds and at various stages of development throughout Europe, the U.S., Latin America, and Australasia, but they are small volunteer institutions, surviving through the sheer will and enthusiasm of a few individuals. Will they be available and useful to people for the long haul? I don’t want them to become boutique vanity collections, open only to a small number of people in the know, but I also recognize that serving large numbers of users is often impossible with a small staff and limited time. Yet the answer for these projects is rarely partnering with or transferring the collections to a bigger institution. The anarchist movement is a diverse and dispersed one, with no large organizations or centralized organizational culture. There are no long-lasting anarchist organizations, as are often found in other social movements. There are no organizations to which an anarchist archive or library could be donated, nor any that has the ability to sponsor or support such a library or archive. This is the tension for me. These collections hold material that can be found not in your local public library, probably not at your local university library, and perhaps only at a few major research libraries with one-of-a-kind manuscript and archival collections. There are a number of important unpublished manuscripts and archival collections in the KSL that you cannot find elsewhere, for example, the records of the long-running anarchist bookstores Bound Together Books and Left Bank Books in San Francisco and Seattle respectively, and the records of the support group for the 1979 U.K. Persons Unknown Trial. I feel strongly as both an anarchist and an archivist that this material should be preserved and made accessible to those who want to use it. As a member of the KSL, I feel equally strongly that the material in this collection should not fall into the hands of a university or state-sponsored research library. That wasn’t what the donors to the collection wanted, or what those who have given so much time and effort to the project wanted. But neither do I think the collection can be given to some amorphous, undefined “anarchist movement.” The responsibility is too great, and the work too important, not to have some committed individual or group responsible and accountable. But as far as I am aware, neither the KSL, nor any of the other anarchist libraries and archives surveyed, have long-range plans for survival. What happens to these collections when those currently involved in the projects no longer have the time, energy, or ability to be part of them? In darker moments, I despair. But most of the time I am hopeful that the anarchist movement will remain relevant to enough people to attract future generations who will want to take up the mantle and care for these collections—just as de Cleyre, Notkin, and Cohen have influenced generations of people to keep the tradition of anarchist libraries alive. In these moments, I believe in the spirit of anarchism that inspires people to act for themselves and each other and to protect, preserve, and continue these projects without any help from the state. Avrich, P. (2006). The modern school movement. Oakland, CA: AK Press. Falk, C., Pateman, B., & Moran, J. (Eds.) (2003). Emma Goldman: A documentary history of the American years, volume 1: Made for America, 1890-1901. Berkeley, CA: University of California Press. Flinn, A. and Stevens, M. (2009). “It is noh mistri, wi mekin histri”: Telling our own story: Independent and community archives in the UK, challenging and subverting the mainstream. In J. Bastian & B. Alexander (Eds. ), Community archives: The shaping of memory (pp. 3-27). London, England: Facet Publishing. Hoyt, A. (2012). The international anarchist archives: A report on conditions and a proposal for action. Theory in Action, 5(4), 30-46. Newman, J. (2011). Sustaining community archives. Aplis, 24(1), 37-45. Published in Informed Agitation: Library and Information Skills in Social Justice Movements and Beyond, edited by Melissa Morrone. (pages 173-184) Sacramento, California : Library Juice Press, 2014. ISBN 9781936117871. See http://informedagitation.info/ and http://libraryjuicepress.com/informed-agitation.php. This is a really good article, thanks to the author for writing it, and for posting it here. I do share the author's concerns for the future. However, I do feel strongly that the best way to protect these materials in long-term and enable them to be freely available to the working class is to digitise them and post them online. And in terms of online publishing, I think it's important that is also done somewhere which is big enough it is not dependent on one or two people, and is backed up elsewhere, and not hosted on other commercial platforms like WordPress or tumblr, which ultimately mean the content can be deleted, as happened to all the geocities websites. I guess it sounds like I'm touting for people to post stuff to libcom, which I guess I kind of am. But only really because we are the biggest archive of anarchist/libertarian socialist materials on the net, and we do fulfil those criteria. If there were another existing project which did this and was bigger and better than us I would get involved with that. Of course, it would be great to have materials all nicely OCRed, but I think technology is going to continue to improve in this area over the coming years. So I think the priority should be just scanning/photographing stuff to get it up in PDF format for now. And hopefully a few years down the line a computer program can just OCR most of it. But unfortunately even scanning material can be quite time consuming. We are able to do it quite quickly but only by chopping up the materials we have and putting them through a double sided feed scanner. So of course this is not possible for unique and one-of-a-kind items. Thank you and love and respect for KSL and other anarchist libraries worldwide who are taking care of our history and always in need of help and support, financial and otherwise.